Our new Quotations Management System, (developed by Chartwell IT in conjunction with one of our Kerridge customers), is now available to all SME K8 and K8SBE users. This enhancement, which sits as a default view upon log in, allows users to track, control and manage the quotations follow-up process in one simple-to-use Workplace. 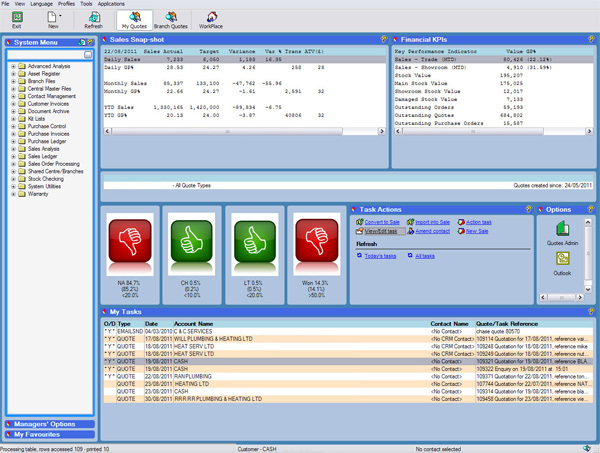 A graphical indicator dashboard allows you to monitor the progress of your quotes and an automatic task-based reminder system, coupled with a management/administration toolset, enables quotes to be actioned quickly and easily. We believe that if you provide quotations to your customers and have issues with following them up then this could be the single most cost-effective enhancement that you could purchase for your system. Click the download link below for a full brochure with details of the Quotations Management System and if you would like to find out more about how your business could benefit from this enhancement please, contact us to arrange a no obligation demo and 6 week ‘try before you buy’ trial.